Ever since I was a young Track and Field athlete, I have grown up performing tempo runs as part of my weekly training regimen. Being a Canadian Track and Field athlete in the 1980’s, we were training under the umbrella of Gerard Mach’s methodologies and enjoyed a very well rounded education in how to prepare for speed and power events. Over 30 years later, athletes are still using tempo runs as a part of their overall preparation for Track and Field and other sports. In this article, I will attempt to cover various aspects of tempo training and how it relates to the support of general athletic development, elite performance and effective recovery. Tempo runs – interval runs directed at building work capacity – have traditionally been categorized as either intensive or extensive. Intensive tempo runs are typically run at faster velocities with relatively short recovery periods, falling into the anaerobic threshold category and, essentially, conditioning your body to adapt to the accumulation of lactic acid in your blood stream, as well as hastening its removal. Intensive tempo runs are common in the preparation of 400m and 800m track athletes who are working and performing in the transition zone between aerobic and anaerobic energy systems (i.e. 40-90 seconds). Longer distance athletes have also used intensive tempo work to build strength endurance properties and lactate tolerance to enhance their overall endurance performance. However, excessive use of intensive tempo workouts can result in excessive fatigue, overtraining, blunted recovery and central nervous system disruptions if the volume is too high or sessions are too frequent. • Avoidance of high-impact, non-compliant surfaces such as sidewalk, pavement and harder artificial surfaces found on a running track. • Elimination of tripping hazards and other ankle-spraining obstacles often found on poorly maintained fields or running trails. • Inclusion of manageable distances (50 to 400 meters) to ensure the quality of running mechanics remains high and excessive fatigue does not enter into the session. • The ability to integrate other activities such as medicine ball passes, bodyweight exercises, flexibility work and core strengthening in between run sets to provide a more comprehensive low-intensity workout. • An easy way to quantify run times and overall intensity over a given, consistent, measureable distance. For coaches and athletes following a high-low training approach – high-intensity training days interspersed by low-intensity tempo days throughout the week – extensive tempo training provides a good fit for building the work capacity of speed and power athletes in a complementary fashion, while enhancing recovery mechanisms prior to the next speed-strength day. Despite being classified as low-intensity work, tempo sessions can be quite demanding due to the sheer volume of work performed. A large circuit of runs over 100 and 200 meters with interspersed exercises involving medicine balls and bodyweight exercises can create significant peripheral fatigue and general adaptations while not producing central nervous system fatigue or muscle soreness the next day. The accumulation of extensive tempo training from week to week can build significant aerobic endurance capacity and muscular endurance for the specific low-intensity demands of a sport, while forming a solid foundation of training upon which other elements are built. For extensive tempo runs, it has been recommended to keep your running velocities at 70% of your best time for a given distance. Theoretically, this makes sense in terms of minimizing both peripheral and central stress on the athlete. However, if you are taking a best running time for 100m from a competition setting on a synthetic track in full spikes and transferring that performance to a natural grass soccer field in training flats and full sweats, the actual time of your 100m tempo run would be much slower than 70% of your best time. For example, a 10.00 second 100 meter runner would not be expected to run 13 second 100m reps for his extensive tempo runs. Given the environmental factors outlined above, I would expect runs of 15-16 seconds for that particular sprinter over 100m tempo runs. In many cases, I recommend that coaches and athletes shoot for a 60-65% effort to be on the safe side, particularly for newcomers to the technique who have yet to find their tempo ‘groove’. It is important to convey to athletes that running faster for extensive tempo will have no positive impact on their sprint performance and can even have a detrimental effect in terms of fatigue. It is very important to make sure the velocity of all your runs is consistent right through all sets. If an athlete is getting slower through the repetitions, their starting velocity is too high or they are simply out of shape and require a lower volume of work at that particular time in the season. The intent of tempo runs is to build an athlete up, not break them down. The logical question for a coach working with various sports and athletes is, “how much is enough?” The answer depends on many things, but most importantly it depends on the demands of your sport and the specific role you play in your sport. Athletes that perform a large volume of low intensity running in their sport, such as soccer players, would require a larger volume of tempo runs as part of the preparation. With a typical high-level soccer player covering a total of 10,000 meters in an average game, we have found that an average of 4,500 to 5,000 meters per tempo session to be appropriate. In an off-season training program, we would have that player perform three tempo sessions per week for a total of 13,500 to 15,000 meters per week. In the case of a football lineman, the requirements are much different since they are covering significantly less mileage in an average game. Depending on the time of year, large offensive lineman may only run 500 to 1000m in a typical session. Accordingly, Track and Field sprinters will see increases in their total tempo volume based on the length of their event. Sprinters covering 100 meters in competition will focus on a tempo volume of 1600 to 2200m per session three times per week. A 200-meter sprinter will work between 2,000 to 3,000 meters per session, while a 400 meter sprinter will work between 3,000 to 4,000 meters in a given session, also working three times per week. The figure below provides an illustrative example of the spectrum of distances covered by different athletes. How Would a Typical Workout be Structured? I was taught to structure my tempo workouts in a logical manner that didn’t require distances that were too long and didn’t discourage an athlete from completing the workout at the appropriate speed. Progressions from repetition to repetition should be smooth in terms of distance covered and velocity performed. 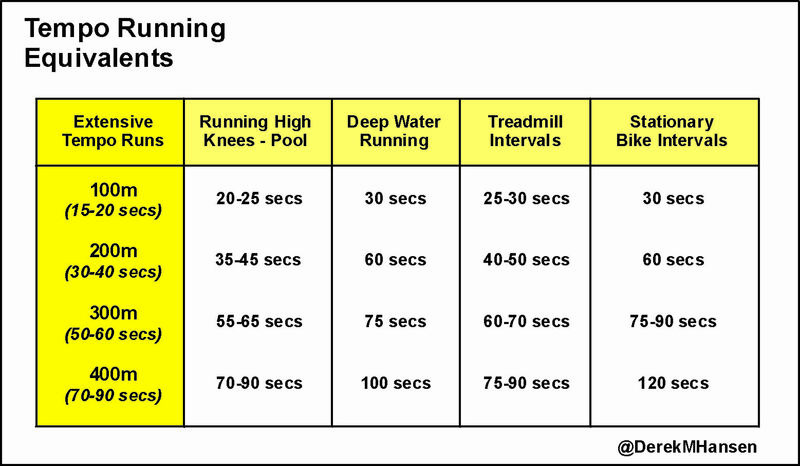 The figure below identifies common patterns for organizing tempo runs. As you can see, runs are added in a manner that include similar distances in a particular set or progressively build in distance from rep to rep. Pyramid structures work well with athletes in terms of building up and unloading down. 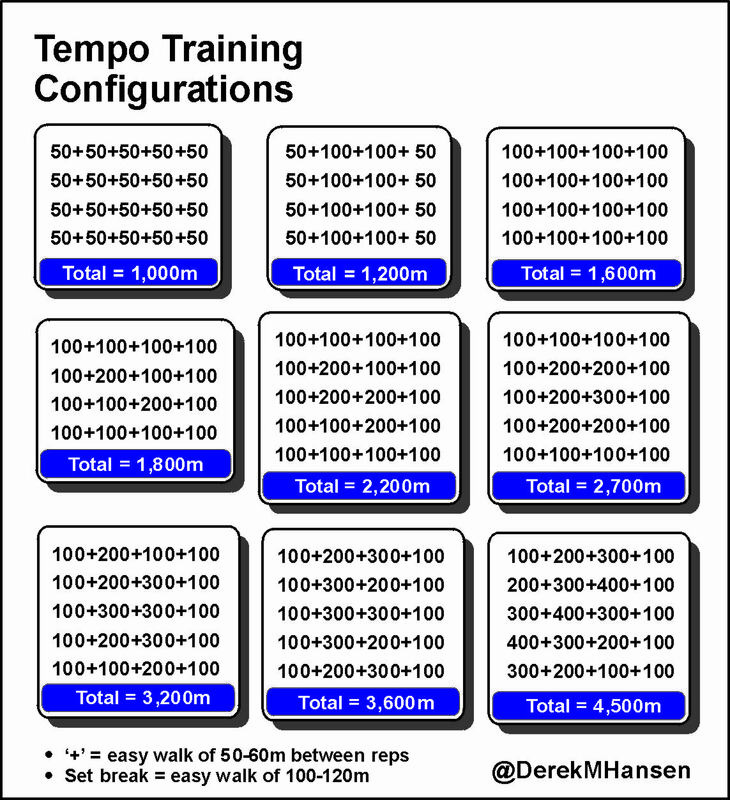 Not all of your tempo workouts need to be organized exactly in this fashion, as some workouts can be as simple as three sets of (4 x 200m) for a total of 2400m. However, using the pyramid structure of reps and sets as a base helps to keep the runs varied with smooth transitions that challenge the athlete but do not bore them to tears. Recoveries between repetitions are typically comprised of easy 50-60m walks to allow the athletes to recover, with a slight reduction in heart rate. In between sets of runs, athletes can walk 100-120m to allow for a greater recovery period. In many cases, medicine ball and bodyweight circuits can be inserted after the inter-set walk to integrate additional work into the low-intensity conditioning as part of a whole-body conditioning approach. 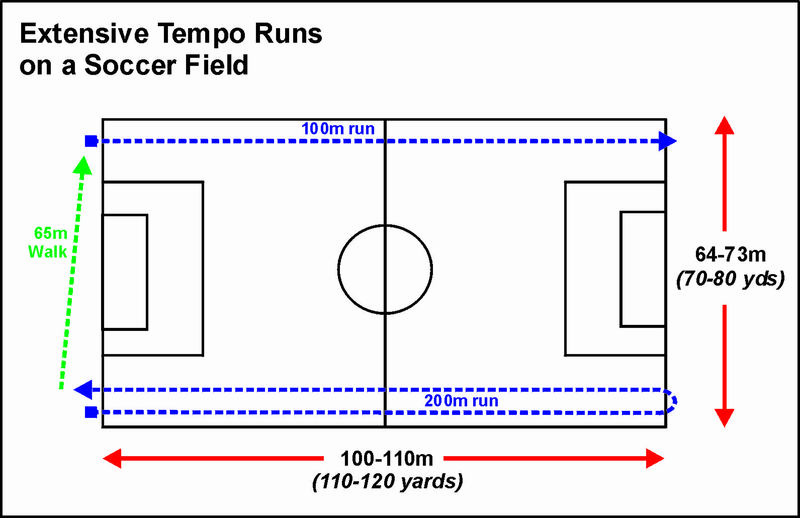 The figure below illustrates how all of the runs can be easily structured on a soccer field using the dimensions of the field to determine running and walking distances. The same could be easily done on an American football field, using field dimensions for runs and end zones for various circuits. These workouts could also be restructured to fit to a smaller dimension field or half-field should practice space come at a premium. The patterns below are not intended to be a rigid template of runs and I encourage coaches to develop patterns that work for their athletes. What are Some Alternatives to Conventional Tempo Runs? Having access to a swimming pool is a definite advantage. Performing running high-knee drills, jumps and other dynamic movements in the shallow end of the pool in chest-deep water is great for developing overall fitness and conditioning, while reducing the impact stress on the lower legs and feet. The resistance and drag created by the aquatic environment makes it easy to challenge athletes in a short amount of time without risk of pulling a muscle or creating a stress fracture, assuming they don’t slip on the deck of the pool. Moving in the water also has a regenerative benefit for the body, providing a hydrotherapeutic effect on an athlete’s muscles. There are different options for doing tempo workouts in the pool. The easiest way to implement tempo runs for non-swimmers is to have them perform running high knee drills over distance in the shallow end. If the athletes do not have much room in a public pool, the drills can be done in place for set durations. Some athletes may prefer to do deep water running with the aid of a small flotation belt. Other athletes may actually swim intervals in the pool if they are good swimmers. While I would always favor running on dry-land – particularly on a softer surface – over the use of gym cardio equipment, the use of a treadmill can be a reasonable alternative for tempo work in situations where weather does not permit outdoor workouts. The decks of most commercial treadmills are well dampened to reduce impact shock on the user and can serve as an appropriate means of supporting low-intensity aerobic work. The treadmill can be set on a slight incline and set at a moderate speed for interval work. In some cases, the treadmill can be set for 20 to 90 second intervals with relatively short rest periods between repetitions. In many cases, I simple advise athletes to grab onto the hand-rails and step off the treadmill, straddling the conveyor belt in a safe manner for their rest periods. It is easy enough to hop back onto the treadmill belt with the use of the hand-rails. Alternatively, athletes can simply slow the treadmill down to walking pace for recovery periods. This method can be more cumbersome than the straddle method, scrolling up and down the velocity settings, but allows for an easy active recovery period between repetitions. Interval workouts on a stationary bike can also be used as an alternative to running workouts. This is particularly useful for larger athletes, such as football linemen, where teams are intent on minimizing impact stresses on athletes as part of their recovery and overall aerobic conditioning workouts. Because stationary bike workouts may not be as demanding as running or pool work, the duration of the interval repetitions may be slightly longer than the other methods. Recovery work between repetitions can be integrated with slower pedaling at lower resistance levels. In some cases, athletes will stand and pedal for their work intervals and sit down and pedal at a lower intensity for their recovery intervals. The figure below identifies relative extensive tempo time equivalents for different modes of exercise. For athletes and coaches that want to be very precise about their work and recovery intensities, heart rate monitors can be used to standardize outputs for these different exercise methods. Most recently, some teams have incorporated sport-specific movement patterns into tempo routines to achieve two objectives within one workout. The intent is to simulate direction changes and agility patterns to improve an athlete’s work capacity while doing movements that are similar to what they would experience in a game. In some cases, it is used to prepare athletes for the drills and rigors of training camp. The workout intensity is adjusted downwards to allow the athletes to rehearse specific movements without the risk of injury or excessive fatigue. 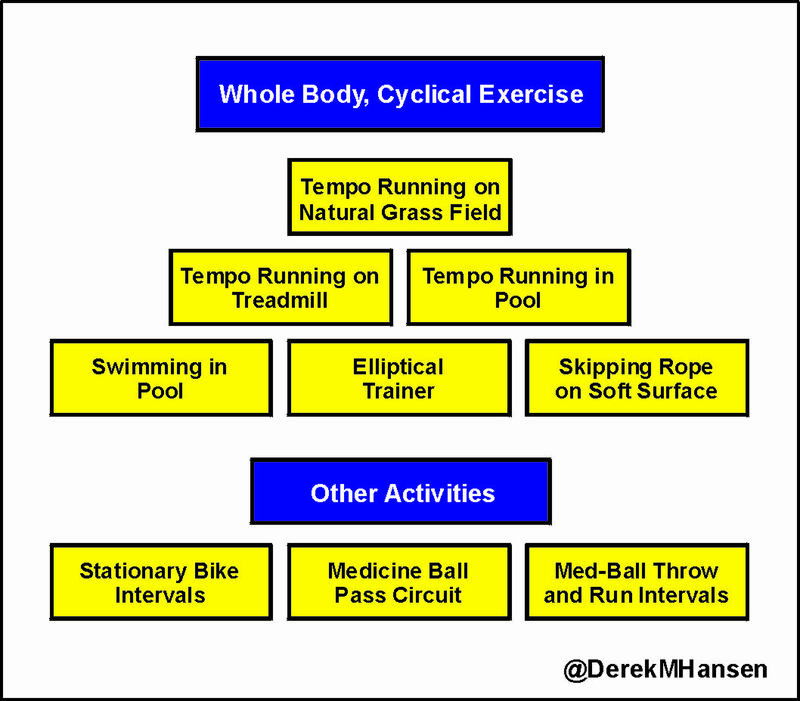 As with conventional tempo methods, work and rest durations can be identified for different exercise configurations. Instead of 30-second linear runs, a coach may choose to employ 20 seconds of short, low-intensity short shuttles with a 30 to 60 second walk recovery over multiple repetitions. The downside of implementing sport-specific tempo configurations is that it becomes much more difficult to identify and adhere to appropriate output intensities. Whenever direction changes are introduced into a movement series, peripheral stresses on soft-tissues and joints can ramp up significantly. While heart-rate monitoring may appear to be an acceptable means of assessing work intensities, it is far more difficult to quantify the loads and stresses being absorbed by tendons, ligaments and muscle tissue. This concern is exacerbated by the fact that overly specific movements can lead to overuse problems, particularly if the athletes are already engaged in practice activities that render sport-specific tempo routines redundant. Additionally, many coaches cannot be trusted to adhere to true low-intensity outputs in these workouts and may encourage athletes to push themselves harder than what is deemed appropriate. If you are considering using a sport-specific tempo approach, I would encourage you to use such workouts in coordination with general tempo routines that place less peripheral stress on the athletes. I would also encourage you to underestimate the optimal workout intensity to stay on the safe side. Remember, one of the main objectives of extensive tempo work is to hasten recovery, not dig a deeper hole. Extensive tempo workouts are an essential part of any high-performance training program. Consistent integration of low-intensity aerobic workouts serves as a solid foundation of fitness and recovery training that balances out the sport-specific work that can lead to over-use conditions. 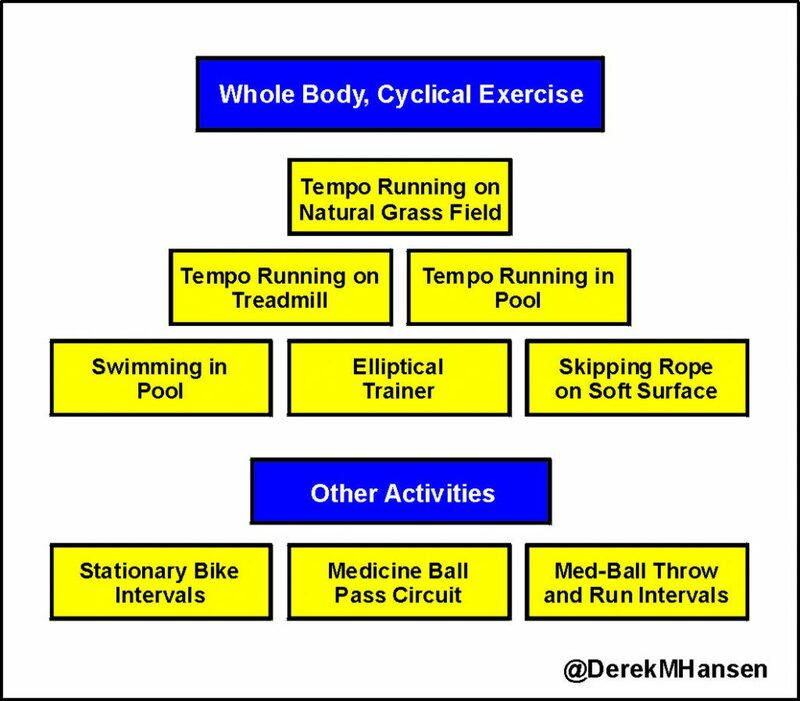 In my experience, whole-body, cyclical exercise provides the most efficient means of implementing extensive tempo work, as identified in the figure below. This concept is supported by discussions I have had with legendary strength coach Al Vermeil and world-renowned sport physical therapist Rob Panariello, both citing the benefits of cyclical work to reset muscle tone, improve circulatory mechanisms and reduce high tension, co-contraction forces around joints following heavy resistance training. In a world where sport-specific training and early specialization is becoming more and more prevalent, athletes need to balance off these training demands with a healthy dose of extensive tempo training. An approach that only strives for bigger, stronger and faster, and does not consider the relative importance of a consistent dose of general, low-intensity training will be doomed to fail with plateaus, injuries and unfulfilled potential.